Positioning abstract modern dance alongside pure classical ballet, The Australian Ballet’s mixed program Symphony in C showcases not only the breadth of talent of the company but also the astounding versatility of the dancers. 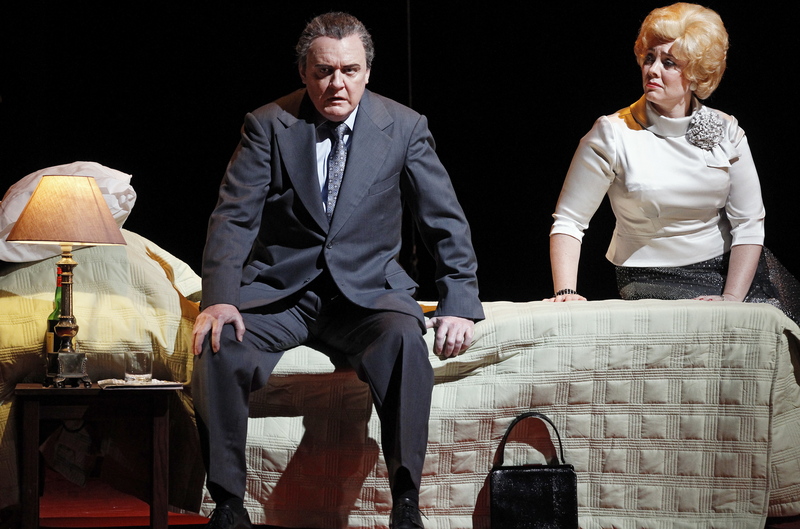 ***To read Man in Chair’s review of David Hallberg in Symphony in C click HERE. Consisting of five short divertissements and one rather grand divertissement, Symphony in C has the vibrant feel of a Gala, and achieves the extraordinary distinction of featuring all ten of The Australian Ballet’s Principal Artists. A key attraction of the program is the inclusion of choreography by current company members Richard House and Alice Topp, clearly demonstrating the company’s dedication to its members and its commitment to new work. The work of House and Topp has featured in Bodytorque evenings, but this program, which premiered in Sydney last year, is their first inclusion in a mainstage presentation. 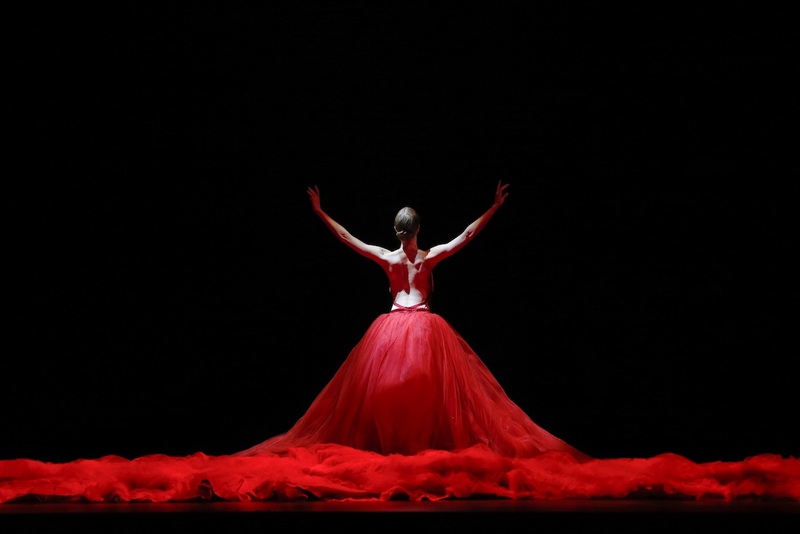 House’s From Silence opens the evening, beginning with the striking image of a woman, Amanda McGuigan, wearing a massive train of silky red fabric. 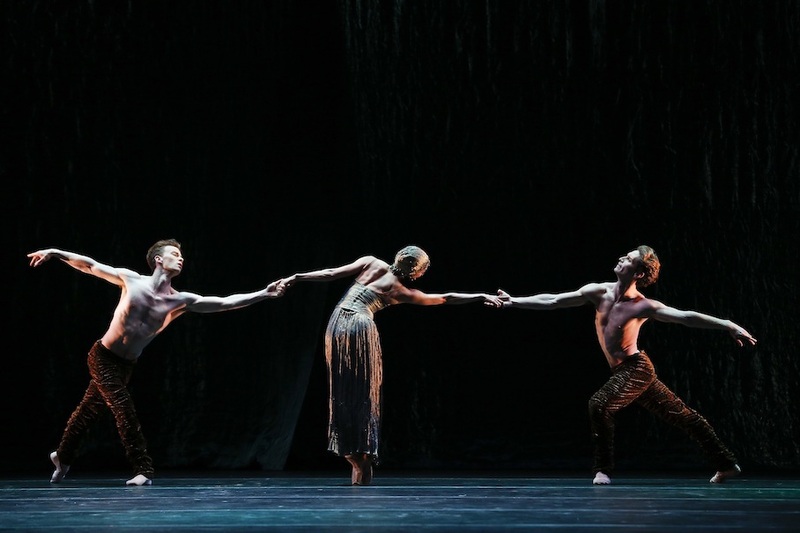 Initially moving sinuously while remaining stationary, the fabric is ripped away, the Michael Nyman score begins and the piece comes to life as McGuigan is joined by Nathan Brook. In front of a towering abstract set piece (by Kat Chan), the first couple goes on to interchange with Amy Harris and Jarryd Madden. Lighting (by Graham Silver) is often dark to the point of almost just giving silhouettes of the dancers. The well-matched capabilities of the quartet makes for a fluid, continuous piece of dance that sets a high standard for the evening, and, indeed, leaves the audience looking forward to more. Topp displays a keen sense of theatricality in addition to proven flair for modern dance. In Little Atlas, two men all but fight for one woman, passing her body back and forth in an intense piece of interplay. A tight circle of lights rises and falls, as does an elegant rear arc, standing out against an inky black background. Kevin Jackson demonstrates his supreme confidence as a leading man from the moment he steps on the stage, with Andrew Killian the perfect complement. Leanne Stojmenov is called upon to match the physicality of the men, which she achieves with terrific intensity. It is a joy to watch these highly accomplished dancers free from the constraints of character, just expressing their pure personal talent for dance. Interspersed amongst these modern works are three highly traditional classical works. No one wears a tiara like Lana Jones, and the pristine quality of her technical work in Grand Pas Classique completely belies the fact that this season marks her return from maternity leave. Male partner Brodie James is somewhat outclassed by Jones, but delivers excellent work in his first solo section. Momentum increases during the piece, leading to a satisfying finale. The Pas de Trois from Imaginary Masque straddles the styles of modern and classical dance. Robyn Hendricks, Jarryd Madden and Nathan Brook perform Stephen Baynes’ sensual choreography to the stirring music of Ravel. A shimmering full size rear curtain is parted to reveal another layer of shimmering fabric, forming a glamorous backdrop to the expertly controlled movement and sheer strength of the dancers’ bodies. Melbourne’s virtuosic sweethearts Ako Kondo and Chengwu Guo close the first half of the program with the thrilling Pas de Deux, Diana and Actéon. Dancing in front of a bright sunny horizon, each of the pair enters to warm welcome applause, and continually earn spontaneous bursts of appreciative applause throughout the piece. Both dancers have perfected the art of the miraculous mid-air pause in their leaps. Guo, in particular, raises the bar yet again in terms of gasp-inducing technical prowess. After interval, the curtain opens on a crisp azure background, as the first of many corps de ballet dancers enter wearing immaculate white tutus. 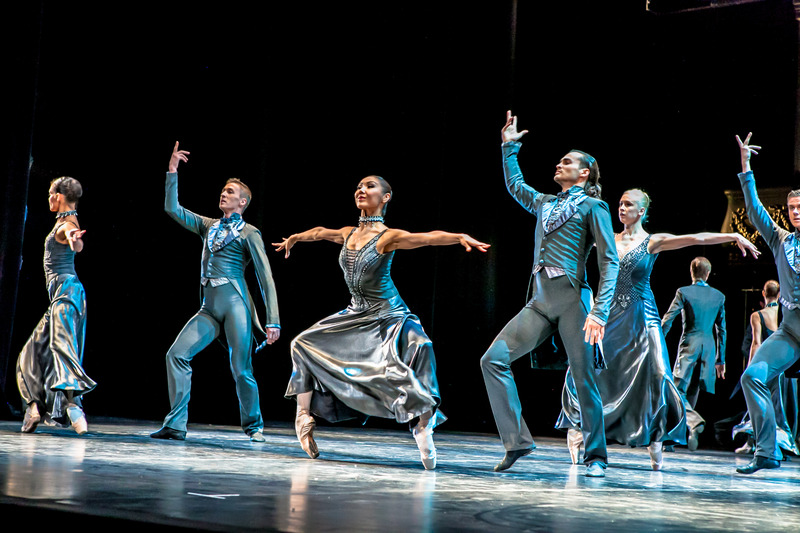 The four movements of Bizet’s score provided choreographer George Balanchine with the scope to encompass four couples, backed by corps de ballet, building to a spectacular massed finale. There is a deceptive simplicity to the choreography, which actually requires precise timing and exact placement. The company achieves this in abundance, presenting the beautifully symmetrical work at its best. Stojmenov and Jackson dance the first movement: Allegro Vivo with utter confidence and charming elegance. With expertly calibrated control, highly experienced principals Amber Scott and Adam Bull bring out the elegant beauty of the deliberately slow second movement, Adagio. Kondo and Guo return for the third movement: Allegro Vivace. The piece does not give the scope for showstopping moves, but their work is perfectly lovely nonetheless. Also entitled Allegro Vivace, the fourth movement features Amy Harris and Ty King Wall, who complete the cycle with characterful flair and effortless athletic grace. While Symphony in C may not cultivate the excitement of the modern triple bills that have become a recent staple, it is nonetheless a highly enjoyable pageant of pure dance and a wonderful opportunity to see all of the company’s Principals in the one showcase.